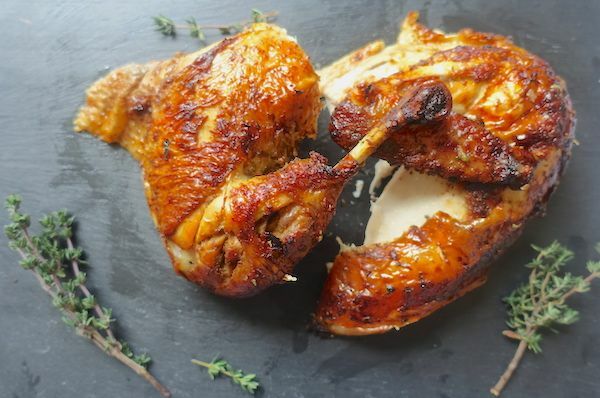 Marinate and roast a chicken like a pro! 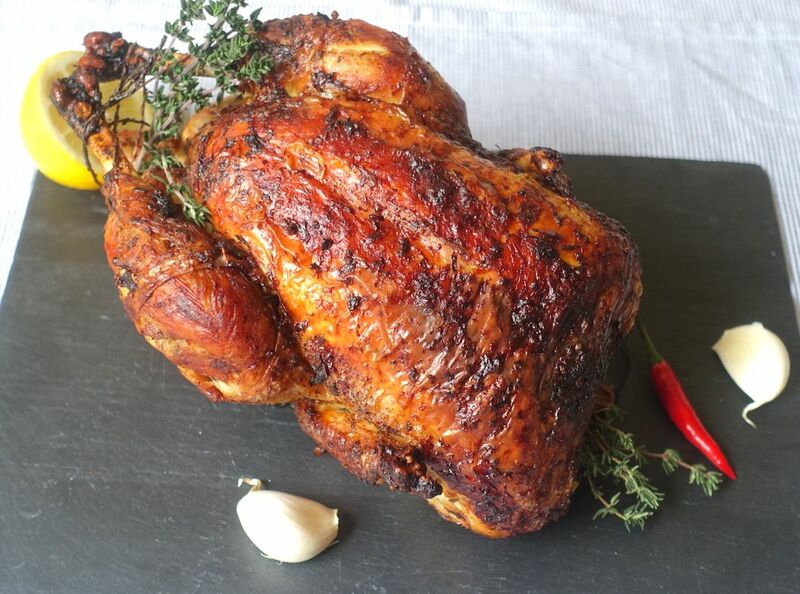 Roasted chicken is an international dish however, the herbs, condiments and spices used to add flavour can be quite different. I grew up in Peru where roasted chicken is very popular. Chillies, herbs and spices are used to add a mix of flavours that invade the palate and smell delicious. 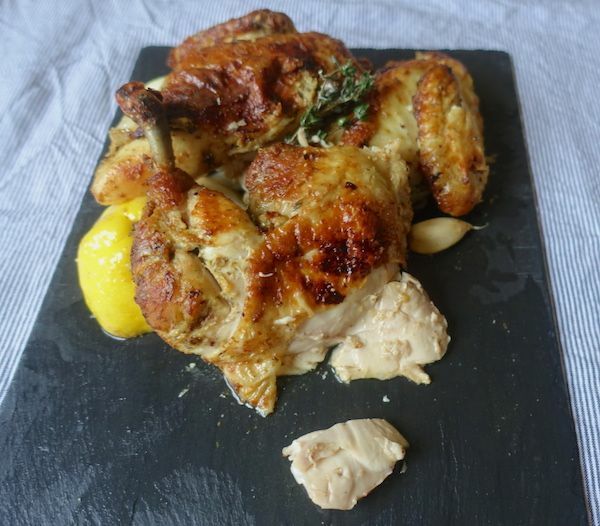 In France, roasted chicken has a subtler flavour and the main herb is thyme. 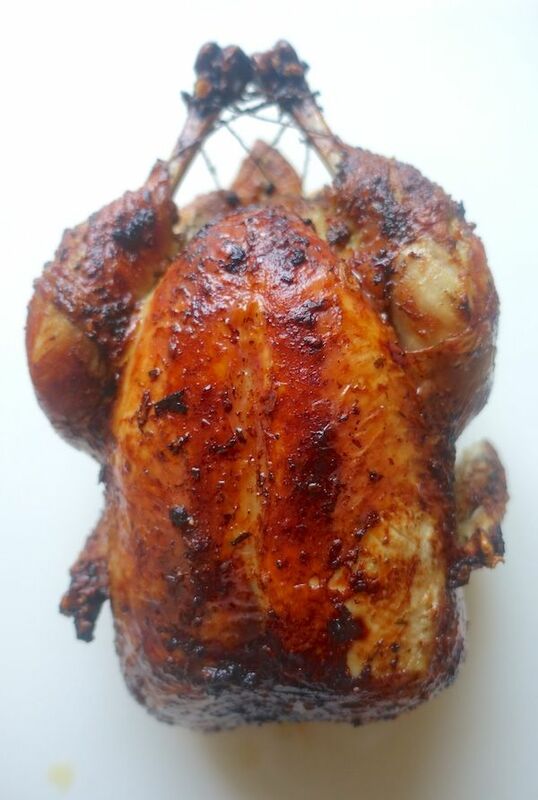 When I smell a roasted chicken with thyme, I’m brought back to the streets and markets of Paris with their big rotisseries and many chickens turning and becoming beautifully golden. 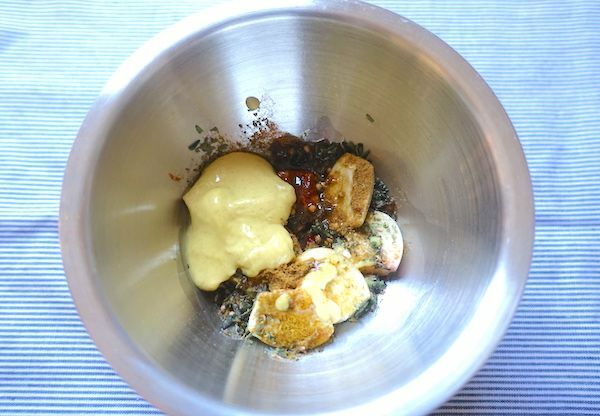 I love how they roast potatoes with the chicken fat dripping on them… just succulent! 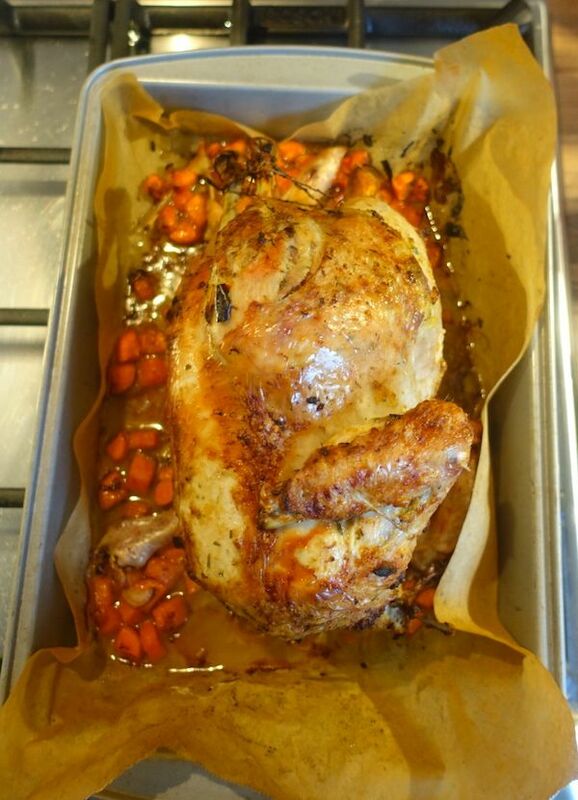 I like to make marinated roasted chickens at home, preferably for Sunday lunch, but any other day will do. This recipe is flavourful and elegant. 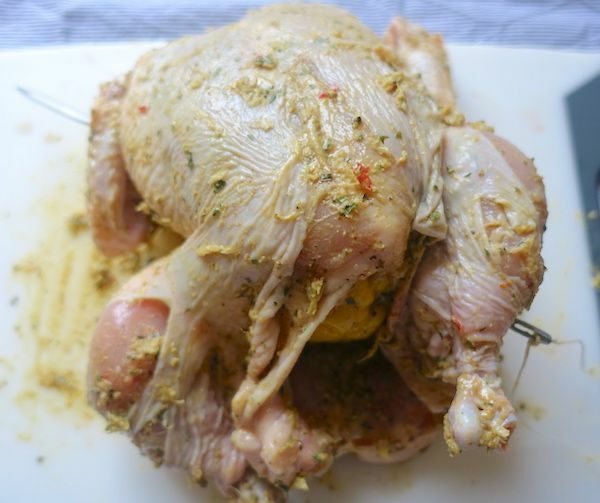 The outcome is a fragrant, tender and juicy chicken. Use a mortar to make a chunky paste with all ingredients. 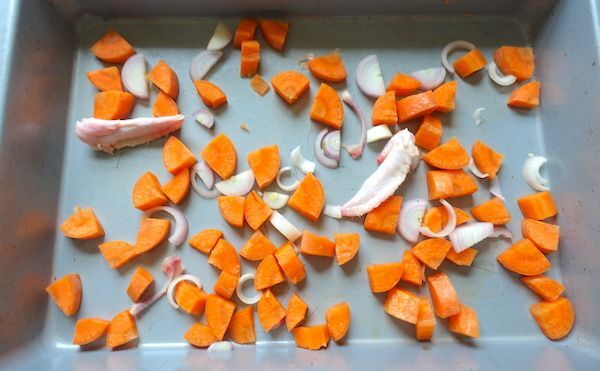 Peel garlic cloves, cut in half lengthwise and remove the germ. Rinse the birds eye chilli and cut off stem. Squeeze and add a few drops of the half lemon that will go inside the chicken. Do this before dipping it in boiling water. 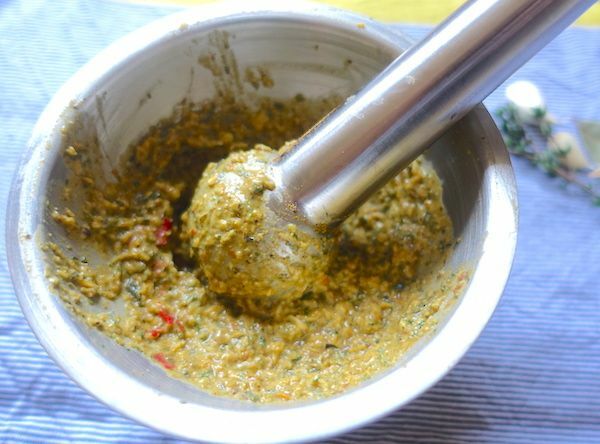 Place all ingredients in a mortar and crush everything until you have a homogeneous yet chunky paste. Reserve. If you have a blow torch, use it to burn any feather left in the chicken. Remove any burnt feather from the chicken with a humid paper towel. 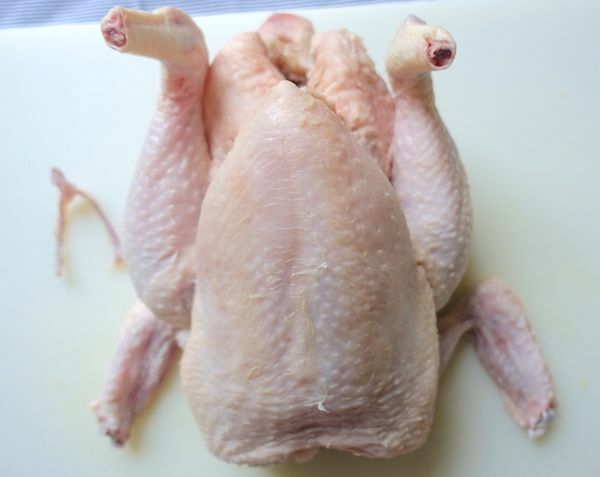 Open the legs and remove any extra fat and giblets inside the chicken. 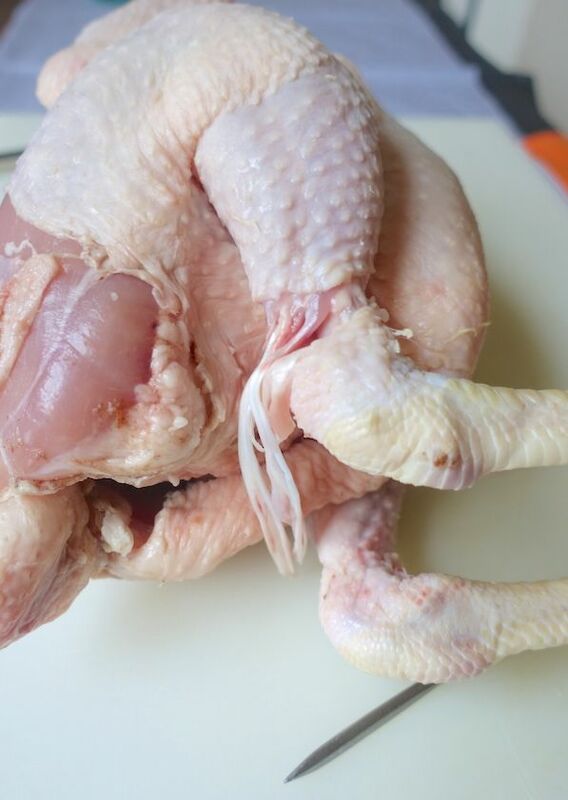 Remove the oil gland from the tail because it may affect the flavour of the cooked chicken. Do not chop off the tail though, just remove the gland delicately. Remove the wish bone by scraping the flesh on the sides and pulling out the bone. This will ease cutting the breasts when the chicken is cooked. Remove the drumstick tendons and the cartilage from the feet. You will need a paring knife and a poultry trussing needle. With the paring knife make an incision around the circumference just above the ankle. Do not cut all the way to the bone. Use the poultry trussing needle to go under each thin white tendon and pull. There will be around seven thin white tendons and a bigger tendon. With this method, the tendon should be pulled from the flesh area and not from the end. In case you cannot remove all the tendons this way (it happens!,) pull the white end of the tendon with your fingers and use the knife to separate the tendon from the flesh by carefully scraping it. Make sure you remove all cartilage from the end of the drumstick and leave it looking clean. Make two incisions on both legs to make sure these cook well. This will add flavour from the inside while cooking. This step will add flavour and juices for basting the chicken. Cut carrot in ‘mirepoix,’ twice lengthwise and ½ cm thick. Add wing tips, wish bone, cartilage from the end of the drumstick and fat removed from the chicken. Rub and massage the marinade all over the chicken and between the skin and the flesh. Use your fingers to open space between the skin and flesh on the breast and carefully add marinade and work from there as much as you can reach without breaking the skin on the breast. It’s better to marinate the chicken for at least two hours or overnight. Then remove roasting pan from the oven and carefully turn to cook on the other side of thigh and drumstick. 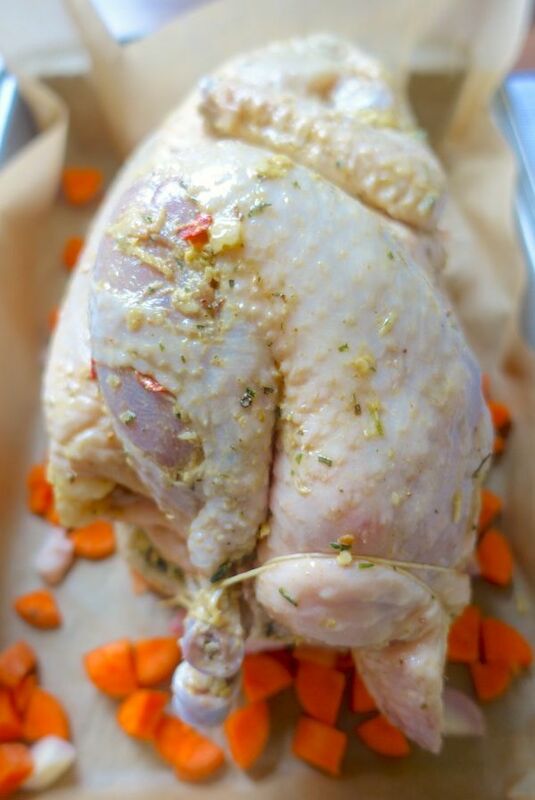 Baste the chicken with juices on the roasting pan. Cook for another 20 minutes. Finally, remove roasting pan from the oven and carefully turn to cook the chicken with the breasts looking up, baste with juices and cook for 20 minutes. Test to see if the chicken is fully cooked. 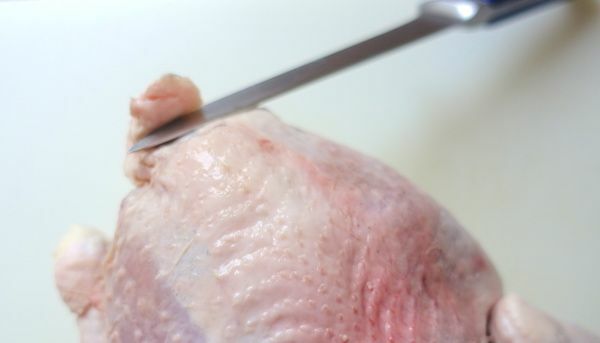 Insert the tip of a knife between the leg and the thigh, press a little bit and see if the juices are clear. If you see blood or a pink juice, cook longer. The meat should feel firm and the skin should be golden. Let rest for about ten minutes on top of a grill on a baking pan. You may let it rest in the oven turned off with the door semi open. Cut the legs first and then the breast. Do you know what the chicken oysters are? They are two small, oyster-shaped pieces of dark meat hidden where the thigh and backbone join. The oysters are the most tender and juicy part of the chicken. They are usually a chef’s favourite part. They say that Louis XIV used to eat only the oyster of the chicken in royal banquets in Versailles. There is a wide variety of chicken available. You’ll find grass fed, corn fed, free range, different sizes, origins and so on. I personally like free range chickens and eggs because these are birds that do not live in a cage but run freely outdoors, have access to sunlight, develop their muscles, burn fat, are healthier and have nice and healthy feathers. Whether they are corn fed or grass fed, will affect the flavour. It’s a matter of taste. Which part of the chicken do you prefer? 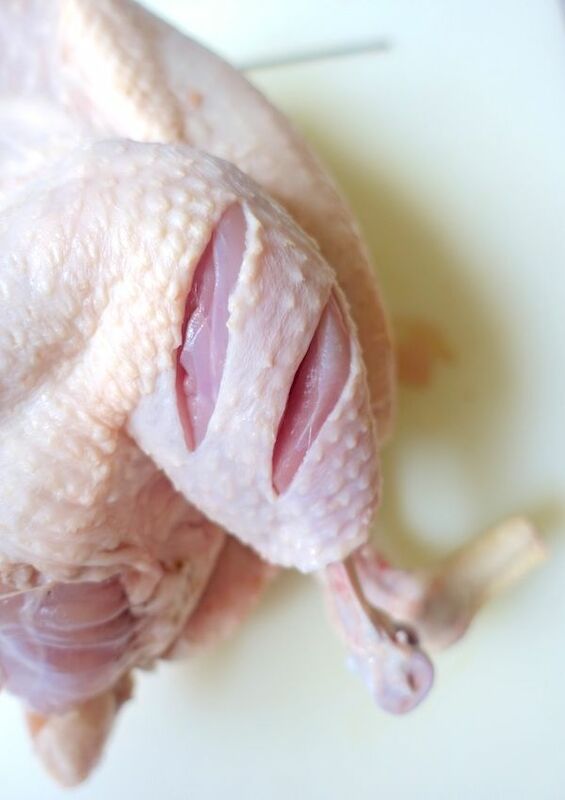 The thigh and drumstick or the breast and wing? I hope you make this recipe and share the outcome in the comment section below. You may want to read other recipes with chicken. I roast chicken often. I will use your seasonings and preparation suggestions! Glad to hear that Ron. Let me know what you think. I hope you like it!